Calgary Geocachers! Could you please be on the lookout for my car that was stolen? It has a custom geocaching-themed front license plate: White with color geocaching logo on left side, Travel Bug logo on right side, and Travel Bug code in the middle. 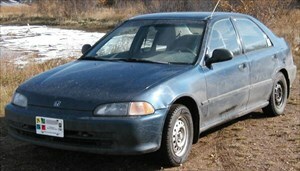 Car is old (1994), Honda Civic 4 door, dark blue, with really rusty wheel rims. Foot-long flexible rubber radio antenna extending from front driver's side front post, pointing backwards. Back license plate is Alberta ZSC723. Stolen Thursday night/Friday morning (Dec. 21/22), from parking at Hampton Inn by Hilton, just north of the Calgary airport. If you see it, PLEASE report it to Calgary Police at 403-266-1234. Thank you! I will update this thread if/when the car is found.